Happy Planet Tower Ride as the name itself suggests, this is our latest ride to keep doing what we do best, Keep the Kids HAPPY. It's a 12 feet heighted tower with of capacity of holding 6 children at a time. The Design and other effects are added with respect to the interests of children. Soundly attractive colours and lights are used. 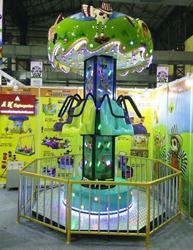 The Circular and UP and DOWN Movements are sure to give them safe thrill that the kids deserve.